Alkaline and lithium disposable batteries have a very slow self-discharge rate. This means that an alkaline or lithium battery left untouched for many years will retain most of its charge. This is why Duracell and other manufacturers can confidently print use by dates on their disposable batteries of 2017 in 2007. Unfortunately NiMH and NiCd* rechargeable batteries have a far faster self-discharge rate – typically 1-3% of stored capacity is lost per DAY and up to 10% is lost just in the first 24 hours after charging. This makes rechargeable batteries completely unsuitable to power items which are used irregularly – for example, an emergency torch left in a vehicle, or in items which draw a small amount of current over a long period of time – for example, a smoke alarm. * Since NiCd (Nickel Cadmium) AA and AAA batteries are becoming rarer due to their negative environmental impact, the rest of this article will discuss NiMH (Nickel-Metal Hydride) batteries only. One way people keep their rechargeable batteries fully charged is trickle-charging – constantly sending a small current through to the batteries 24 hours per day. Trickle-charging is not only bad for the NiMH batteries, it is also a very inefficient use of electricity when a mains-powered battery charger is used. 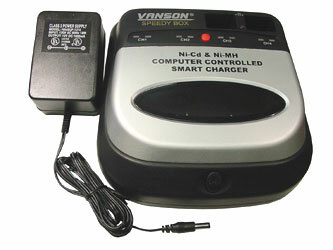 Some microprocessor controlled battery chargers (such as the one pictured above) are much better, sending occasion pulses of current to the batteries rather than keeping them constantly under charge. However, these still consume a lot of electricity, and they are expensive. 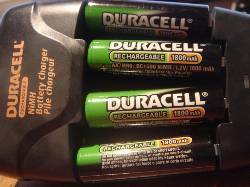 An alternative to trickle-charging rechargeable batteries is to store them in the freezer. By keeping NiMH batteries at temperatures well below freezing, their self-discharge rate can reduce to as little as 1-3% per MONTH. The graph below shows the self-discharge rate for NiMH cells at temperatures from 25 to 60 degrees Celcius. It can be seen that simply storing the batteries in a cool environment will have a major effect on the self-discharge rate. Putting them in the extreme cold of a freezer reduces the self-discharge rate still further. If you are concerned about the potential (as yet untested and undocumented) risks of the life of a battery being reduced by this freezing and thawing process, put the batteries at the back of the refrigerator where they will be kept at just above freezing point. When storing batteries in the freezer it is essential that they are placed (after charging fully) into a watertight container or strong sandwich bag and labelled. Ideally they should be left fitted inside a battery holder which has had its connecting leads cut off to remove the risk of a battery short-circuiting when the contents of the freezer are moved around. When the time comes to use the batteries they should be left to warm up to room temperature before use. NiMH batteries perform very poorly at low temperatures and can vent gas which will reduce the lifetime of the battery permanently. In humid environments condensation can form on the surface of the batteries which should be immediately dried off. Condensation could corrode the battery and also cause problems when it is left coating a battery inserted into an electronic device. Bookshelves are usually the least humid part of the house, so if you put the batteries to warm up on a shelf full of books (or even inside the Yellow Pages! ), condensation will be much less of a problem. Click here to purchase high quality large capacity AA NiMH, and AAA NiMH rechargeable batteries from the REUK Shop.